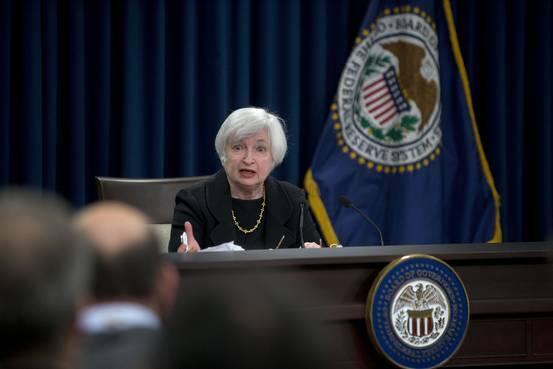 The Federal Reserve has announced it is raising interest rates by 0.25 percentage points. This is the US rate’s first increase since 2006. The move is likely to cause ripples around the world, and could increase pressure on the UK to raise rates. It could also mean higher borrowing costs for developing economies, many of which are already seeing slow growth. There are concerns that a rise will compound that slowdown, as higher rates in the US could strengthen the dollar, the currency in which many countries and companies borrow. It puts US policy at odds with that in Europe, where even easier borrowing terms are being implemented. The European Central Bank (ECB) earlier this month cut overnight deposit rates from minus 0.2% to minus 0.3% and extended a €60 billion stimulus program. The US rate rise vote was unanimous. The Fed also raised its projection for its economic growth next year slightly, from 2.3% to 2.4%. That suggests the bank does not think the rate increase will damage growth. US share markets jumped in response. The Dow Jones went from a 50-point rise to stand up 79 points at 17,612.79 – a 0.5% gain. Rates in the US have been at near-zero since 2008. The Fed cited as the reasons for its action increased household spending and investment by business, along with a continued low rate of inflation. The Fed has said it will continue to monitor inflation and employment to determine if and when further rise are justified. The Federal Reserve chairwoman, Janet Yellen, said the committee was confident the economy would “continue to strengthen” but it still has “room for improvement”. Future action will depend on how the economy moves forward and will be gradual. Janet Yellen acknowledged weakness remained in the labor market, particularly wage growth. She warned that if the Fed had continued to delay a rate rise, it could have been forced to tighten monetary policy too quickly, something that could have led to another recession. The Fed’s medium-term projection for the Federal Funds rate is 1.5% in 2016 and 2.5% in 2017. The bank will not get close to normal levels of around 3.5% until 2018 when it expects the economy will be back on a solid track. “Were the economy to disappoint, the Federal Funds rate would likely rise more slowly,” said Janet Yellen.